High quality training you will remember. Advocating For The Preservation Of Life During Cardiac Emergencies. CPR – Cardiopulmonary Resuscitation – is an emergency lifesaving procedure performed when the heart stops beating. Immediate CPR can double or triple chances of survival after cardiac arrest. According to the AHA in 2015, sudden cardiac arrest mortality in the US was 366,807. CPR, especially if administered immediately after cardiac arrest, increases a person’s chances of survival. About 90 percent of people who experience an out-of-hospital cardiac arrest die. ( meaning most incidences occur at home, work, out living life) Mostly due to no bystanders taking action. In addition to no bystander assistance the lack of AED use awareness inhibits a more successful survivor rate. 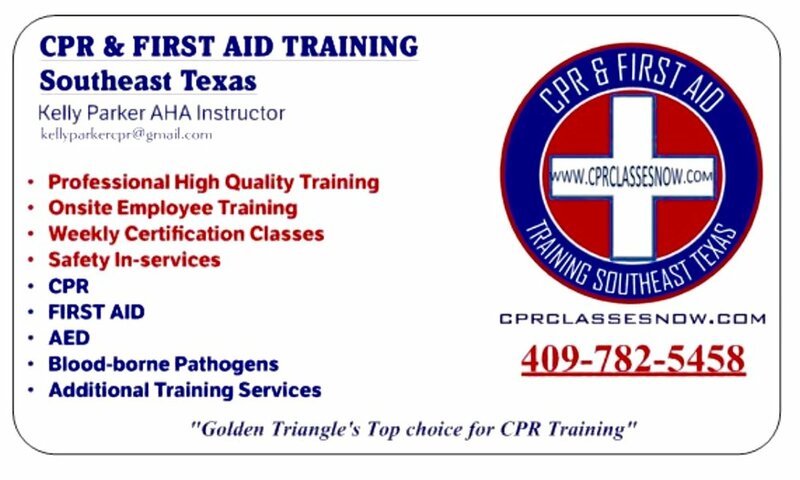 CPR & First Aid Training Southeast Texas teaches and encourages communities to raise awareness about the importance of CPR and AED training for all ages. After all, the individuals who attend our class whether by job requirements or their own choice become the bystanders. Bystanders we teach how and when to take initiative by performing CPR. Bystander assistance can double or triple a cardiac arrest victims chances of survival and return to normal life. Get in touch to schedule your company, family, group or individual training today, or use the contact form at the bottom of this page to inquire which services are right for you. What is more important to plan, host, or learn than the skills necessary to save a life? CPR can double or triple a victim’s chance of survival. Sadly, less than eight percent of people who suffer cardiac arrest outside the hospital survive. Why? Not enough people know when and how to perform effective CPR. Please be as detailed as possible. Include your industry along with any specific requests. To best service your inquiry, it is recommended that you first tell us what you want to achieve. You may also email or call for more assistance. ALSO: Personal Trainers, Apartment Complex Employees, Hotel Staff, In addition to providing High Quality Instruction in Learning Life Saving CPR Skills, Blood-borne Pathogen Training Is offered to Tattoo Artists, Maintenance Workers, and those who have to potential to come into contact with bodily fluids working in their industry.